Badrinath temple’s flag hoisting on the top of Badrinath temple. Barffani baba ashram in the Narayan mountain range of Badrinath, Uttarakhand. Badrinath(3,415 metres) is located in the Garhwal hills, on the banks of Alaknanda River.It is a holy town for Hindus in chamoli district of Uttarakhand. It is the most important religious sites among the Chardham. Dwarka, Jagannath Puri, and Rameshwaram are the other three religious sites among the Chardham. The town got its name from the holy temple of Badrinath. 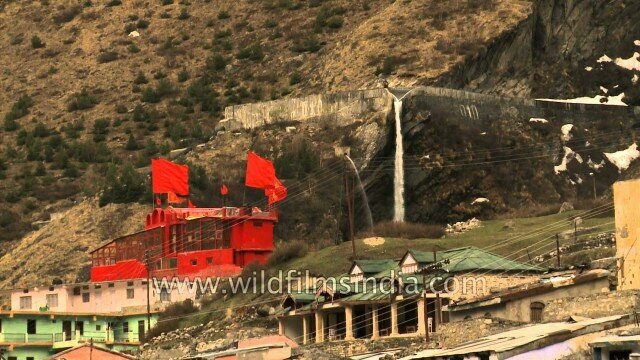 Badrinath is situated 301km north of Rishikesh. It is situated in the background of Nilkantha Peak (6560 metres) and between the Nar and Narayana mountain range. According to a legend, Adi Shankara found a image of Lord Badrinarayan made of black stone (Saligram) in Alaknanda river. He initially kept it in a cave near Tapt kund or hot spring which was later shifted by king of Garhwal to the present temple in 16th century. The hot spring still exists near this temple and taking bath in it keeps a very important religious significance. It is a place sacred to Vishnu, particularly in Vishnu’s dual form of Nara-Narayana. Its reference is also given in Hindu Scriptures. This place is full of Bael fruit i.e, Badri or ‘Ber’ in hindi. According to a another legend Vishnu meditated here for couple of hundered years. Godess Lakshmi gave shelter to him for all those years while he was doing meditation. She later turned into a Badri herself and her Lord was thus known as Badrinath. Another legend is when Godess Ganga was about to descend on earth for the welfare of humanity, it was split into two parts, with Alaknanda one of them so that the mother earth could withstand her force. This footage is part of the professionally-shot broadcast stock footage archive of Wilderness Films India Ltd., the largest collection of HD imagery from South Asia. The Wilderness Films India collection comprises of tens of thousands of hours of high quality broadcast imagery, mostly shot on HDCAM / SR 1080i High Definition, Alexa, SR, HDV and XDCAM. Write to us for licensing this footage on a broadcast format, for use in your production! We are happy to be commissioned to film for you or else provide you with broadcast crewing and production solutions across South Asia. We pride ourselves in bringing the best of India and South Asia to the world… Reach us at rupindang @ gmail . com and admin@wildfilmsindia.com.